I would have chosen pumps over the sandals for this more serious celebration. I love the outfit of the lady to the right of the Queen at the stage. She looks serenely gorgeous and cool and the other woman looks lovely, too. I do feel sorry for the handsome men who must endure the very warm uniforms. 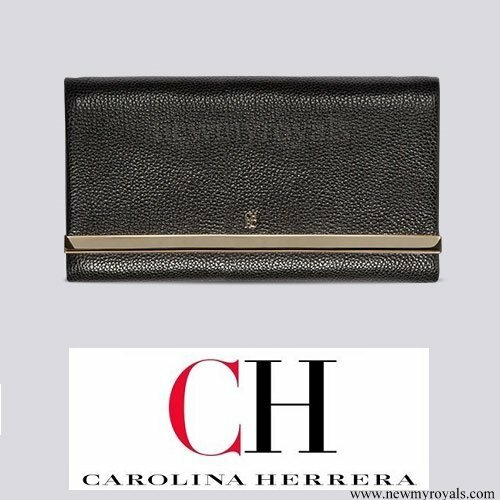 Queen Letizia could give lessons on how to carry a clutch purse and how to dress to fit your body style. Amazing how all of these well-dressed women manage to not break an ankle on the ridiculous shoes that are currently in style. With Caroline Herrera you cannot go wrong! She looks tired and a bit pasty, yesterday I noticed it too. And the King as well. Quite hot in Madrid. Her style is outstanding! 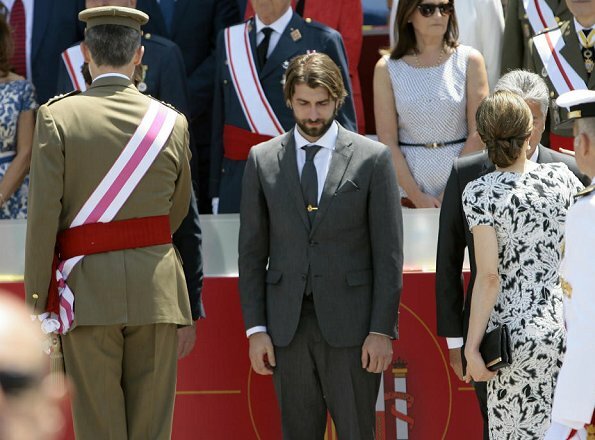 (Maybe they had 2 tough days, full of schedules!and talks, dinners... with the Portuguese President.) Live can be hard. I thought her face looked different. May be the make-up? 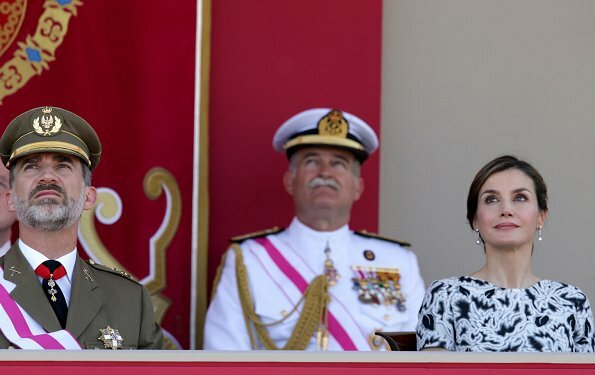 Hermosa y elegante, sencilla y chic la Reina de España. Perfección. 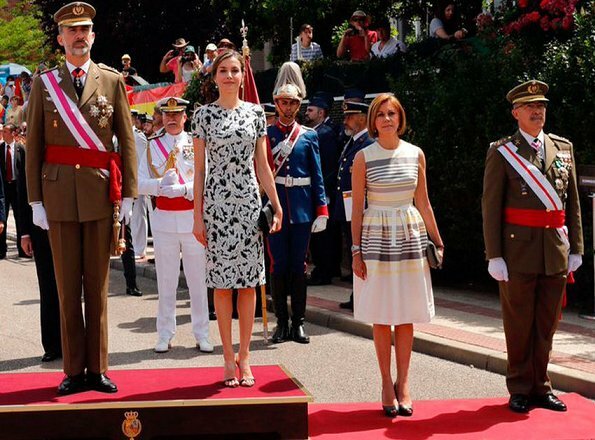 La dama del vestido de rayas es Mª Dolores de Cospedal, Ministra de Defensa, muy guapa también. 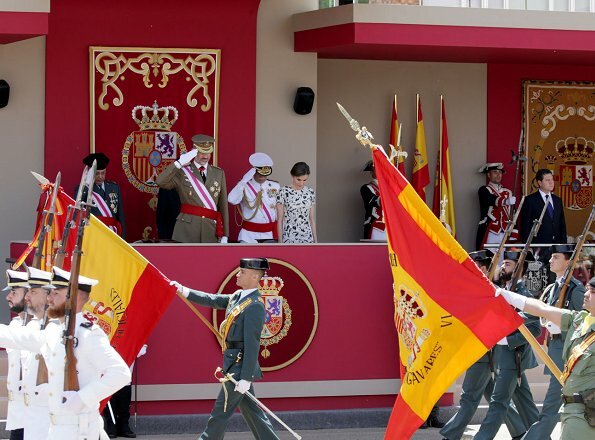 That lady is María Dolores de Cospedal, Minister of Defense. Really classy. Dear Angie, don't feed the troll. Was loving this, until the choice of footwear. Superb hairdo and shoes! This look is refined and classic at the same time. The minister looks perfect too. Gorgeous! Her dress, and everything else. And the Minister of Defence looks great also. 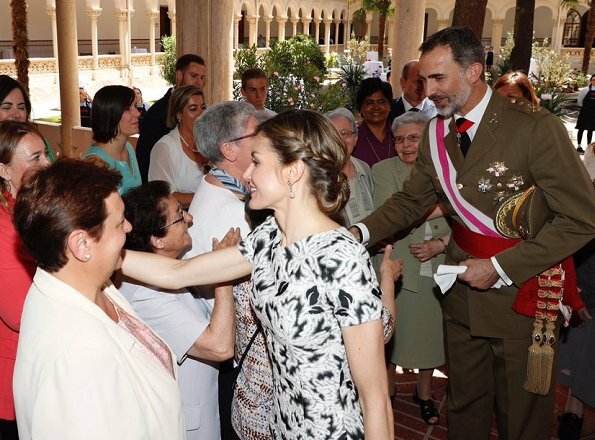 Letizia looks very beautiful in her CH dress. And her hairdo...wowww. Such a beauty. But those stripper shoes of hers...not suitable for the queen to wear at an official event!! The Minister of Defence looks great as well. Vicka, one wonders why enter a fashion blog to make judgmental and ignorant comments that have absolutely nothing to do with the subject at hand. A lot of us visit this particular site because the critique is respectful regardless of whether we agree or not, please let's keep the conversation civil.